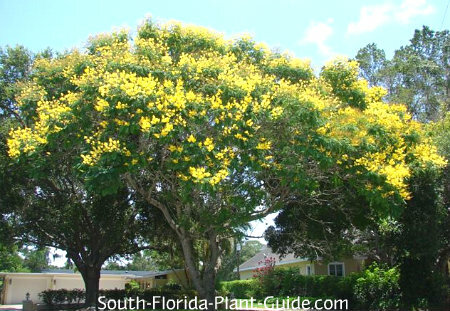 The beautiful and graceful peltophorum tree is often called "Yellow Poinciana" because it looks just like a royal poinciana but with very showy yellow blossoms. These trees work best on a large property or as a single specimen tree in a medium-sized yard. 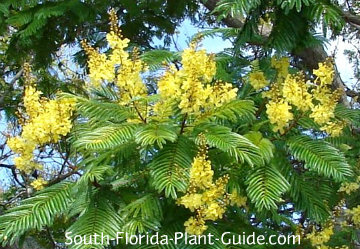 The breathtaking, frothy flowers appear in late summer on a treetop full of soft, fern-like leaves. The tree is bare in winter and the canopy of fine-leafed foliage in spring, summer and fall creates an understory of dappled shade. This provides a perfect environment for certain plants that thrive in the less-blazing sun of winter and more filtered light in summer. These trees are fast growers to 40 feet. No two grow alike, but the general rule of thumb is to expect a broad-spreading crown. Place the tree in an area of full to part sun with this eventual growth in mind. Peltphorums are cold tolerant, growing anywhere in South Florida. 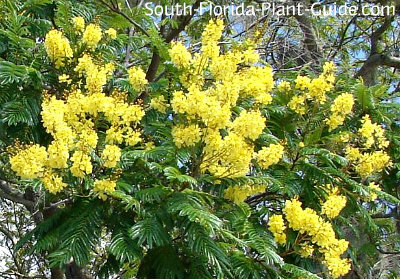 It's the only cold hardy tree of the three look-alikes that include jacaranda and royal poinciana. They're deciduous with wine-colored seed pods that decorate the branches during winter. Bloom time is late summer through early autumn. These trees require a bit of age - about 4 years old - before they begin to flower. Add top soil or organic peat moss to the hole when you plant. You may want to add in composted cow manure to the mix. This tree is considered drought-tolerant once established, but does best with a regular watering schedule that allows a bit of time for the soil to dry out between waterings. Trimming isn't necessary other than to prune branch ends after flowering is done in order to promote more bushy growth. Also you can remove any too-low branches as the plant matures. The seed pods will fall off on their own, and aren't a nuisance. Fertilize 3 times a year - once each in spring, summer and fall - with a quality granular fertilizer. Because the canopy's eventual size is somewhat unpredictable, the tree is best planted 20 feet from the house. Come in 10 feet or more from walks and driveways to avoid eventual problems with roots. This tree will grow in a container while it's still very young, but plant it in the ground at the earliest possible time. 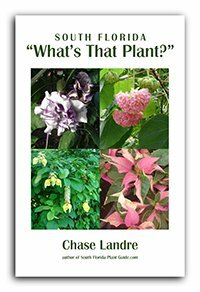 COMPANION PLANT SUGGESTIONS: Underplant with things that take winter sun and light summer shade, including variegated arboricola, dwarf tibouchina, coontie, Indian hawthorne, penta, dwarf azalea, and pinwheel jasmine.